All praise is due to Allaah and may the salaat and salaam be upon the Messenger. To proceed: We are pleased to present AlHajuri.Com, an educational website and resource to aid in being firm upon the aqidah, sticking to the Sunnah, honouring the Scholars and developing moderation by studying and learning aspects of the character of Yahya al-Hajuri and doing the exact opposite. In the wasiyyah (legacy) of Shaykh Muqbil (rahimahullaah), he advised with the returning of any affair that arose collectively to, "Shaykh Muhammad bin Abd al-Wahhab (al-Wasabee), Shaykh Abu al-Hasan al-Ma'ribee (who later deviated), Shaykh Muhammad al-Imaam, Shaykh Abdul Azeez al-Bur'ee, Shaykh Abdullah al-Uthmaan, Shaykh Yahya al-Hajuri (who also deviated) and Shaykh Abdur-Rahmaan al-Adanee." As for Abu al-Hasan al-Ma'ribee then he exposed his Tamyee' (innovating principles to shelter the innovators and jamaa'aat of hizbiyyah) and his being mentioned in the wasiyyah of Shaykh Muqbil counted for nothing after his heart deviated and was turned. And as for Yahya al-Hajuri, then he went in the other direction, that of Haddaadiyyah (extremism and exaggeration, showing great harshness to the scholars of Ahl al-Sunnah and their followers). Both departed from the way of Shaykh Muqbil. One to negligence and the other to extremism. Each has his followers and defenders. Just as the Shaykhs of Yemen got together and took a firm position against Abu al-Hasan al-Ma'ribi, the mumayyi', when his deviation became clear, likewise, they have all taken a firm position against Yahya al-Hajuri, the haddaadi, after his deviations were made clear and no sign of any repentance has been forthcoming. Despite these deviations of these two individuals, the da'wah of Shaykh Muqbil continues and is present in many of the other maraakiz (centres) in Yemen by the other students of Shaykh Muqbil, such as Shaykh Muhammad bin Abd al-Wahhab al-Wasabi. Yahya al-Hajuri has created a cult following in Dammaaj, resulting in an extreme type of ghuluww (exaggeration) in his person and a climate of fear where no one dares to oppose the opinion of al-Hajuri (otherwise discipline, detention or expulsion follows). Al-Hajuri is not known for maintaining strong ties with the Major Scholars of the Sunnah or for humbling himself and travelling to these Scholars. On the contrary, he deems himself self-sufficient and independent, and for that reason great calamities began to appear from him and continued to appear. The book to the right is probably the best and most concise of what has been compiled regarding Yahya al-Hajuri and his calamities. It is called "al-Mukhtasar Fee Bayaan Ba'd Mukhaalafaat Yahya al-Hajuri Limaa Alayhi Ahl al-Hadith wal-Athar" and is a compilation of most of what al-Hajuri has been criticized for. We shall be drawing on this book and (other materials) for the objectives of this site. 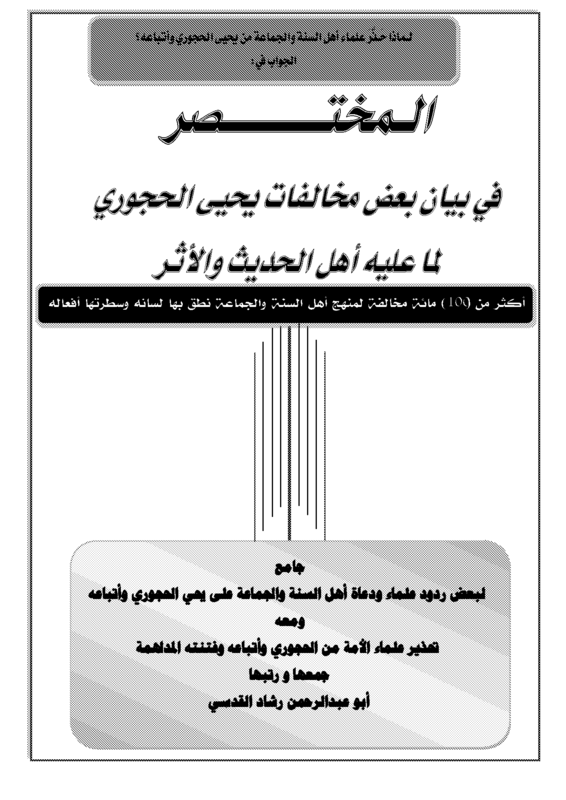 Download the entire book here in Arabic (PDF). Yahya al-Hajuri has mistakes in Tawhid, aqidah, evil statements and positions regarding the Messenger of Allaah (sallallaahu alayhi wasallam), towards the Companions, towards the Caliph Uthmaan (radiallaahu anhu), and towards the Scholars of Sunnah and Salafiyyah. His tongue is foul and evil and is known to lie and deceive. He and his statements have been refuted collectively by Shaykh Salih al-Fawzan, Shaykh Rabee', Shaykh Ahmad al-Najmee, Shaykh Ubayd al-Jaabiree, Shaykh Muhammad bin Haadee, Shaykh Muhammad bin Abd al-Wahhaab al-Wasibee, the remaining Shaykhs of Yemen (al-Hajuri is isolated) and many others.